Bryan O'Connell started his day short-stacked and finished early. In late position, O'Connell raised with and Greg Hopkins re-raised on pocket tens. After consideration, O'Connell shoved all in and looked to the board for help. The board brought and no help for O'Connell, who cashed $16,353 for his ninth-place finish. Ray Coburn was next to leave. After running low on chips, he bet the pot on pocket fours, which Gioi Luong raised, holding A-K. The flop , hurt Coburn, and the turn and river didn't bail him out, giving Luong the pot and sending Coburn out in eighth place with $22,894. Moments later, Luong suffered a tough beat after getting the chips in good against Bronshtein. The heavy betting took place after an flop, and Luong showed to Bronshtein's . The turn, though, brought the , filling up Bronshtein, and no redraw ace appeared on the river. Luong exited in seventh for $31,070. Bronshtein played aggressively throughout the afternoon, his stack climbing to over one million in a little over two hours. Bob Collison made his stand with and caught Bronshtein bullying with , and was fine after both the flop and turn, but a four on the river again hit Bronshtein, ending Collison's day in sixth with $41,427. Pete Lawson finally slowed Bronshtein's onslaught. Bronshtein raised on A-9 and Lawson moved in with pocket jacks. A board of did not improve Bronshtein's hand and Lawson doubled up to 650,000. Lawson's luck held again on a three-way pot with David Zarrin and Hopkins who both flopped aces on A-J-10. After Hopkins folded, the river and the incited Zarrin to go all in, only to run into Lawson's K-Q for the flopped straight. Zarrin was eliminated in fifth, collecting $52,874. Lawson moved into the lead with the big pots, which he held until Bronshtein again found a fortunate river. Holding J-10, Lawson held top two after the flop and turn. Bronshtein, though, hung in with and the flush darw, and when the spiked on the river, claimed the big pot and moved back to the front. Lawson's situation deteriorated as he took hits from Hopkins and Newburger. The final blow came as Lawson went all in on K-8 against Newburger's pocket deuces. The board did not improve Lawson's hand and he left in fourth place with $72,497. By this time the three remaining players — Bronshtein, Hopkins, and Newburger — all held nearly equal stacks. Bronshtein stayed aggressive, pitting his against Hopkins' . 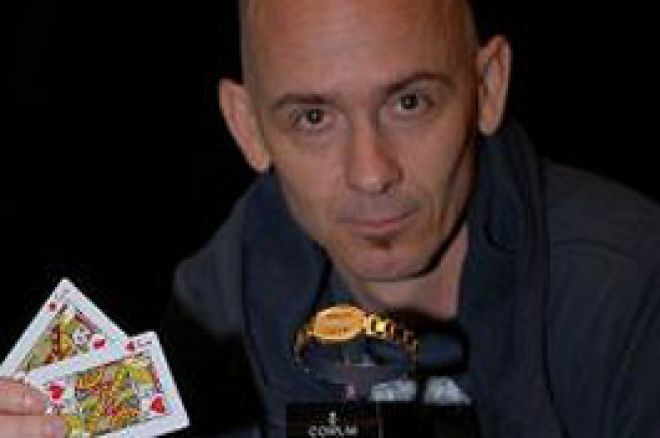 After a flop, Hopkins went all in, and the turn brought the chance of a runner-runner flush, but the river was instead the , giving Hopkins the higher pair and the pot. This crippled Bronshtein to 360,000. Bronshtein then went all in on pocket sixes and ran into Hopkins' A-10. The flop delivered A-Q-8, pairing Hopkins' ace. The , gave Hopkins an unneeded straight, and Bronshtein departed in third place with $109,018. Hopkins held the advantage over Newburger 1.66M to 740,000 going into heads-up play, and the two began slowly, seeking the big trap. Finally, the collision came when Newburger paired his on a flop of , but Hopkins flopped top pair with his . Hopkins bet the pot, then bet it again after the turn . Newburger stuck around one more time, but after Hopkins went all in on the river , Newburger mucked, though in dire condition at 275,000. Newburger managed to chip away, though, and drew all the way back to even. Finally, a classic race situation put the chips in pre-flop, with Newburger showing and Hopkins . The flop gave Newburger a gutshot draw but kept Hopkins ahead, but the turn removed the gutshot chance and the river missed Newburger's remaining outs. Newburger took second place with $165,707, while Hopkins claimed the winner's bracelet and $269,274 first prize. WSOP Stories: Is the World Series of Poker Really a Crapshoot? WSOP Stories: $50,000 H.O.R.S.E. Event to Kick Off; Who's Worth Watching?